From left: Thomas Whitman, Lois Whitman, Martin Whitman, AFTAU President and CEO Gail Reiss and Dean of TAU's Faculty of Management Prof. Moshe Zviran at the Whitman Family Center for Coexistence inauguration ceremony. Martin and Lois Whitman inaugurated the Whitman Family Center for Coexistence at TAU’s Faculty of Management, during a ceremony held at the Faculty’s International Advisory Board meeting in New York this June. The Center, dedicated to advancing the cause of peace and coexistence, will award scholarships for the Faculty’s prestigious MBA programs to students who play a key role in defining the culture of coexistence in Israel – such as Palestinians, Israeli Arabs, Druze, Ethiopians, and the Jewish ultra-Orthodox – as well as support activities by students and faculty who seek to advance this cause. “The Whitman family gift reflects a deep commitment to the Jewish value of Tikkun Olam, and we are honored and humbled to be able to work toward this goal by supporting those whose inclusion in the world of tomorrow will improve the world for us all,” said Prof. Moshe Zviran, Dean of the Faculty of Management. Prof. Zviran added that “The new Center will allow us, as Israel’s leading business school, to level the playing field for promising individuals from underprivileged population groups by enabling them to acquire the managerial tools needed to realize their potential and bring down social, ethnic and religious barriers by the sheer force of their accomplishments." Mr. Whitman, a TAU Honorary Doctor, and his wife have long been dedicated to supporting the advancement of disadvantaged communities. 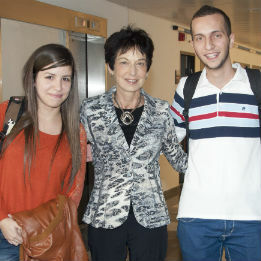 In 2006, they established a major endowment at TAU to provide scholarships to Israeli-Arab students. 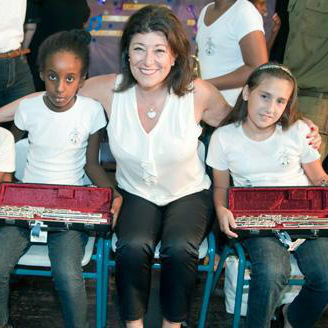 Committed to advancing the rights and opportunities of youth worldwide for decades, the Whitmans have a long association with supporting education at Tel Aviv University and other institutions, including a similar endowment at Syracuse University, which funds scholarships for African-American and Latino students. Mr. Whitman is a legendary investment advisor, the founder of Third Avenue Management LLC and a recognized expert in successfully identifying value in distressed securities. For the past three decades, Whitman has been a Distinguished Management Fellow at the Yale School of Management. Mrs. Whitman is the founder of the Children’s Rights Division of Human Rights Watch. Mr. Whitman was awarded the Tshetshik Prize for Studies on Israeli Security by TAU's Jaffee Center for Strategic Studies in 1999. Currently, he serves on the board of the Institute for National Security Studies (INSS), an external institute of Tel Aviv University.